Everyone had food fears. The things that you just can’t bring yourself to try, the things you can’t make; even though you want to. For me, that challenge lies with seafood. I don’t eat a lot of it (unless I eat out, then the answer is always squid), and never cook it. 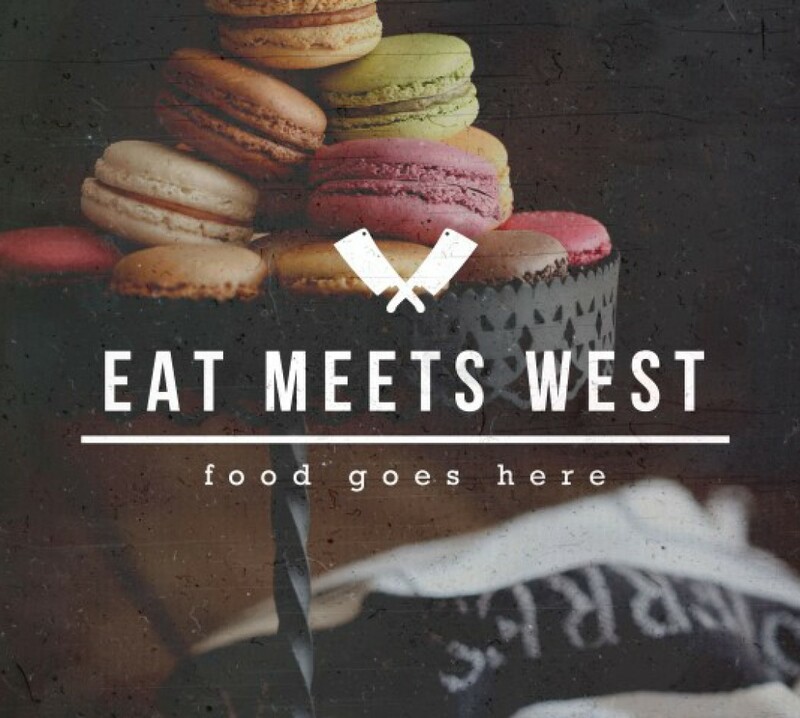 It’s the culinary equivalent of being afraid of clowns; we all are, it’s ok. There are many horror stories; food poisoning is always the culprit of a dodgy oyster; scallops are notoriously tricky to get right; a strong smell of fish makes many of us instantly nauseous. 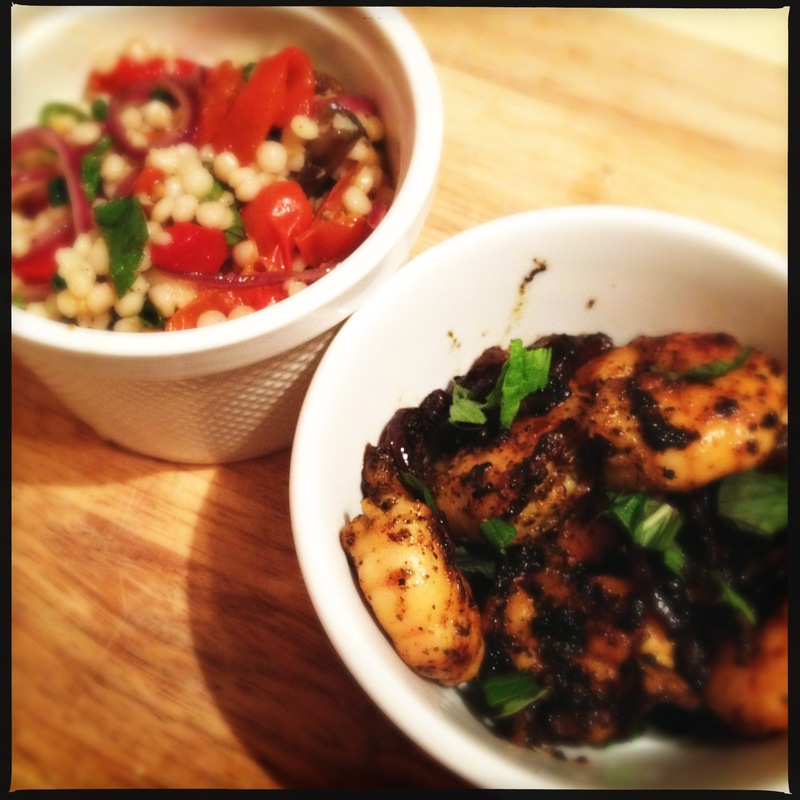 But, after receiving Riki’s Chermoula for fish in the April box for Urban Locavore, I had no more excuses left. Paul from Urban Locavore has said in our conversations that his worst nightmare is having a product in the box which gets put in a cupboard and forgotten about. Being one who hates to disappoint, I couldn’t do that to Paul or Riki, so the time has come for me to face my fears. So, I set about buying prawns for the first time. A quick trip to Kailis in Leederville meant there were no fears of bad produce; there were no excuses for not trying, and no going back. The whole thing was deceptively simple, to the point where I was slightly convinced I must have done something wrong. But, lo and behold, dinner was delicious and I’m food poisoning free. Success! 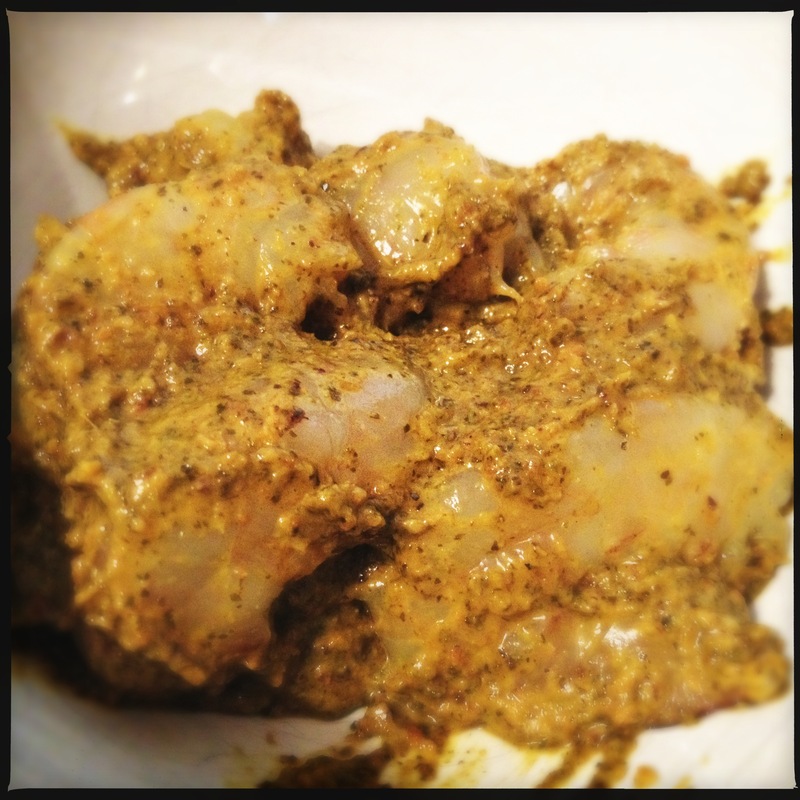 1) Combine prawns and chermoula in a bowl. Cover and marinate in the fridge for a couple of hours. 2) Place the tomatoes, mushrooms and garlic in a roasting tray. Drizzle with olive oil, toss to coat, and roast in the oven for 30 minutes at 170*c. At the same time, place the couscous in a saucepan of chicken stock or water and boil until cooked, about 10 minutes. 3) Heat olive oil in a pan over medium heat. Cook the onion until soft. Set aside. Add the prawns and cook for 10 minutes or until cooked through. 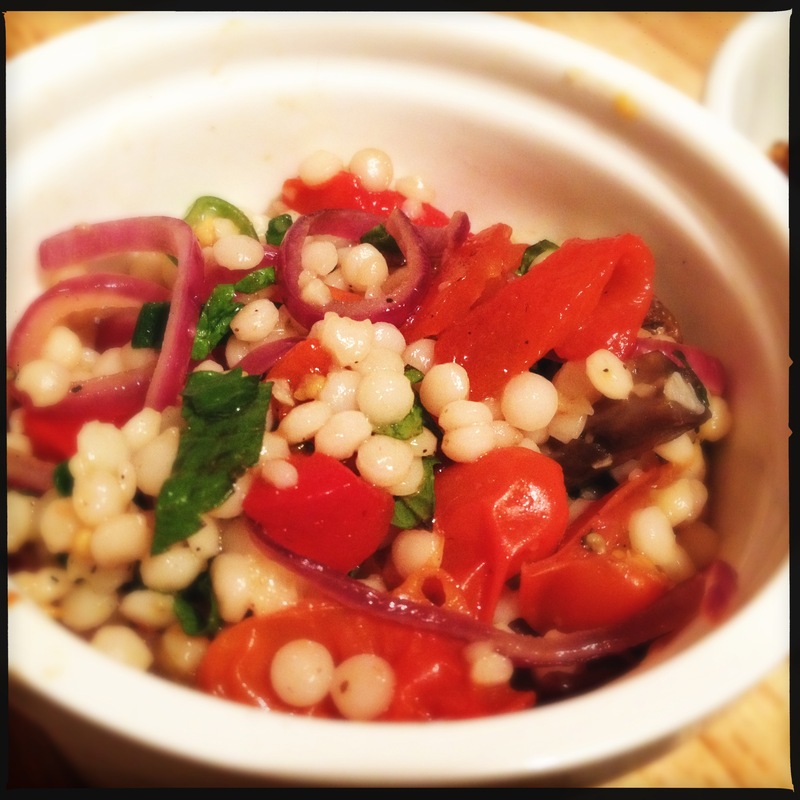 4) Combine the roasted vegetables, red onion, couscous and mint in a bowl. 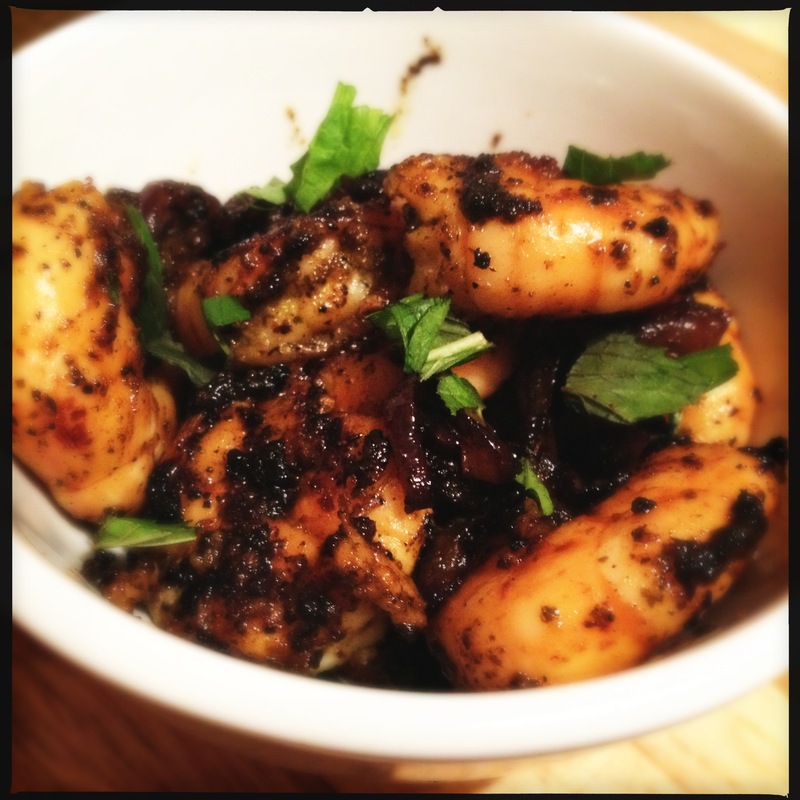 5) Serve prawns in a bowl, topped with mint. There are some things in life you should never have to witness. Girls who mistake opaque stockings for pants. Or jeggings, for that matter. Also on this list: Me, when using knives. It’s kind of like watching a train wreck. Painful to watch, but you can’t look away, because someone might lose a limb (being me). I maintain it’s half the reason my mum wouldn’t let me in her kitchen, it was just faster to cook herself, then the drive to the hospital for stitches. Which is why I hate cooking things that require me to cook things that are cumbersome. Things like pumpkin, for example. But, no, I really wanted this particular dish for dinner, so, here I am, cutting up a pumpkin. It wasn’t until after I’d managed to get the damn thing peeled (and narrowly avoided cutting myself no less than 3 times) that my housemate wandered into the kitchen and asked why I didn’t just cut it up into little pieces, and then peel it? I can’t be trusted in book stores. All those books, with their rich, dusty smells of paper, the cracking of spines and rustles of pages… Bookstores call me with their siren song. I picked up Maha by Shane Delia, and it was love at first sight. The first recipe was an amazing dessert which I hope one of you will let me make for you soon, because I’m dying to test it out, and the second, is this one. I loved it for several reasons. It’s one of those really easy dinners, with not a lot of effort (once you get past me and the awkward pumpkin), it’s vegetarian – the original recipe doesn’t call for chicken – and it’s easily adaptable. Add more veggies. Throw in beef. Whatever. 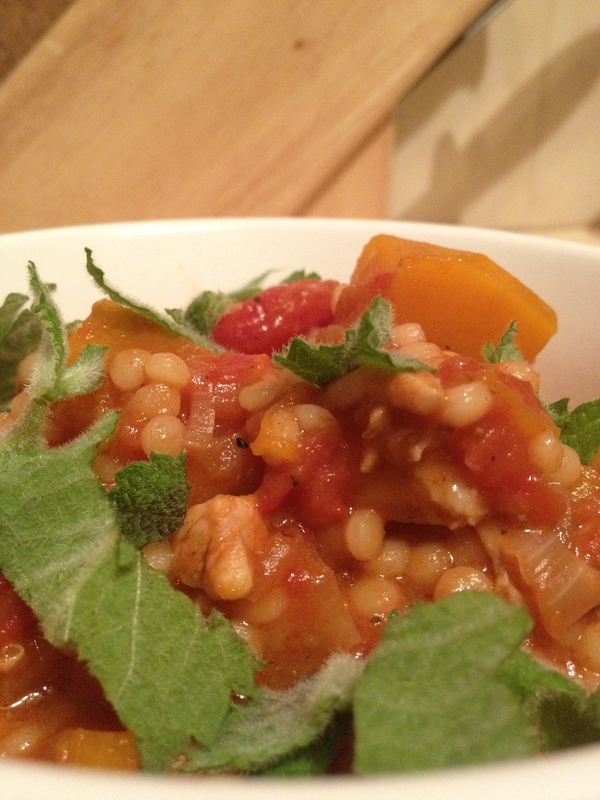 On top of all that, it uses one of my favourite ingredients, Israeli couscous. 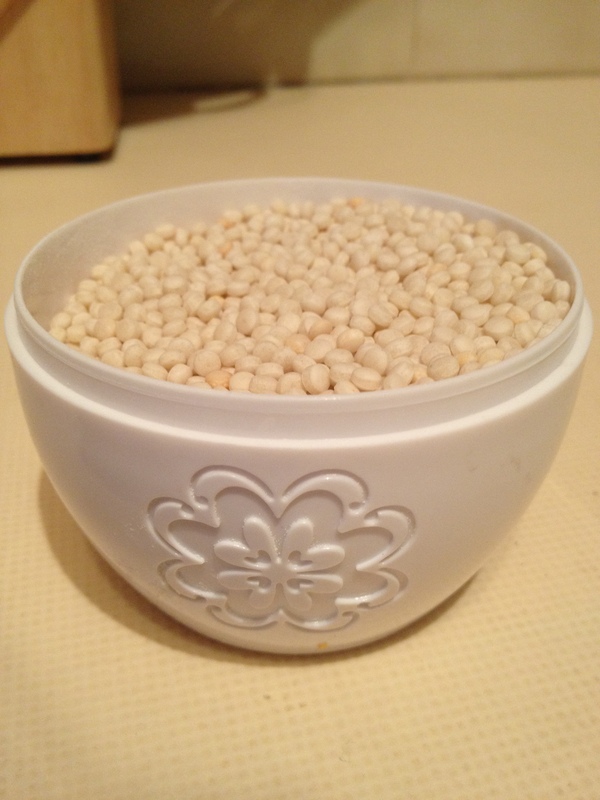 I use it in place of rice or regular couscous in cooking, in salads, everything. It’s becoming easier to find, but I get it from The Re Store, Kakulas Brothers or specialty stores. Totally worth it. 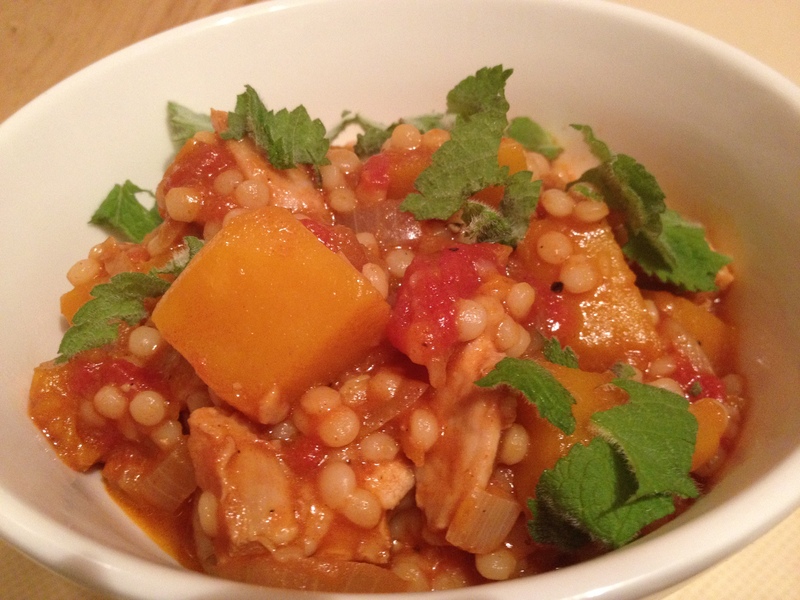 Cook couscous in boiling water for 8 minutes, then drain and set aside. Heat oil in a heavy based saucepan over medium heat, add the onion, toum paste & saffron threads, cook for 5 minutes or until onion softens. 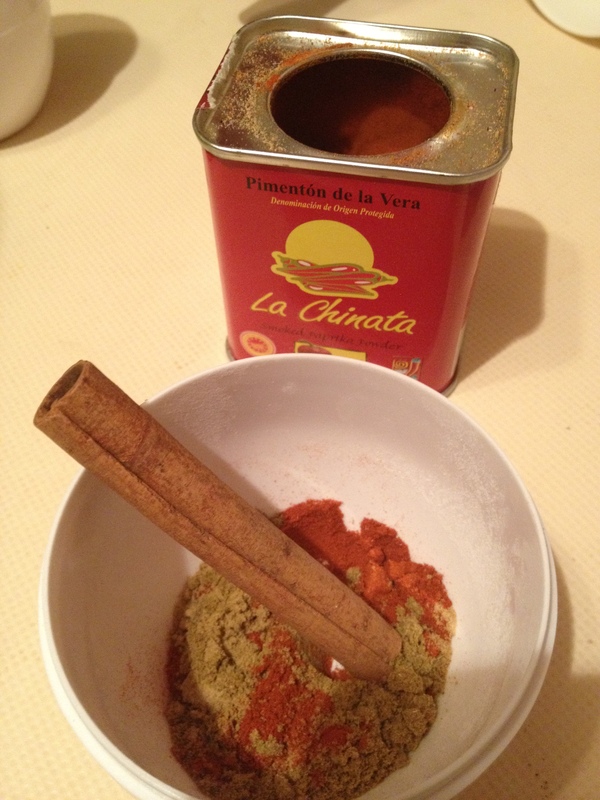 Add spices and cook for a few minutes, stirring constantly. 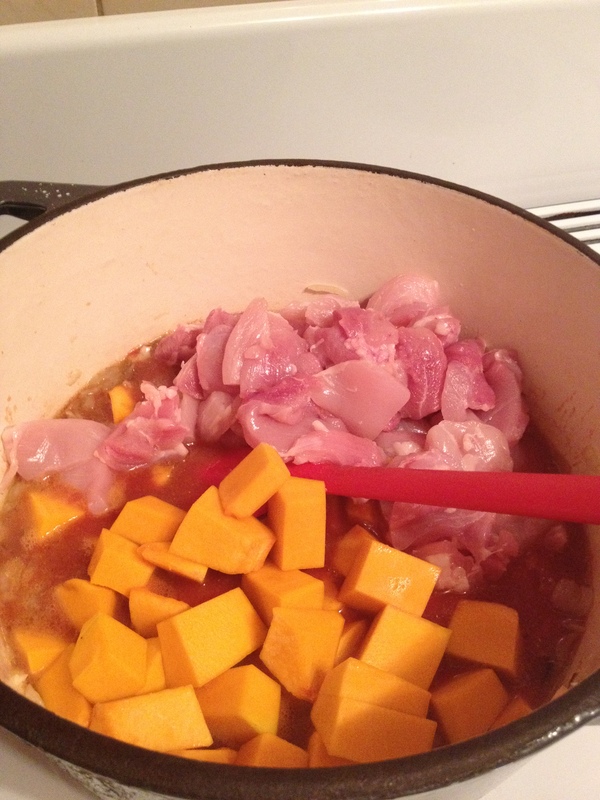 Add pumpkin, chicken, tomatoes and stock, simmer over medium heat for a further 15 minutes or until pumpkin is soft and sauce is starting to thicken. Stir in couscous and cook for a further 2 minutes to soak up most of the liquid. Finish with a sprinkling of herbs and serve immediately. Note: Toum is a paste made from 10 garlic cloves, 1 tsp salt & 1 1/2 tbsp olive oil and smooshed until creamy in a mortar and pestle. That was more than I’d use in a lifetime, so I just used 4 cloves of garlic, a pinch of salt and maybe a teaspoon of oil, and squished it until it was close enough to a paste/I got distracted. Perfect. Normally when recipes say to garnish with herbs, I normally write it off because you generally only need a little bit, and you end up with all these herbs in the bottom of the fridge that you never get around to using. That annoys me. However, I discovered mint in the garden today, so I figured, may as well. I absolutely, without question, insist that you include the mint. It’s brilliant. By the way, this is brilliant the as leftovers. The best thing about cooking with spices like this, is that they develop over time, meaning it’s actually better the next day. Very pleased with my efforts for the evening, I hit the showers. And proceeded to promptly cut open the side of my thumb opening a shampoo bottle. Go figure.